All five of the conditions which are screened for as part of the expanded newborn screening pilot programme are inherited conditions. This means that the diseases are transmitted in our genes and DNA. 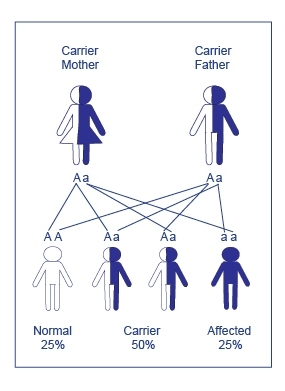 Everyone has two copies of the gene for each of the conditions. Where a baby has the condition, this means that they have inherited two faulty copies of the gene. Each parent has one normal copy and one faulty copy and are said to be ‘carriers’. When two carriers have a baby, they have a 1 in 4 (25 %) chance in each pregnancy of having a child with the condition.